Unlike the original recipe, this low carb, sugar-free, and gluten-free version of Pumpkin Gooey Butter Cake won’t put you into a sugar coma like the original recipe, which includes a package of storebought cake mix and a whole pound of the white stuff. It is still, however, a stick-to-your-ribs ending to a Thanksgiving feast! I simply reduced the sugar and left in all of the nourishing fats and flavor. Just half of a piece of this rich cake is completely satisfying, likely because all of the sugar that gets your seratonin going and kicks up your appetite is blissfully absent from this low carb creation. It’s nice to have only one stuffed Turkey at the Thanksgiving table, no? Pumpkiny, sweet, and buttery. Just a bit gooey at room temperature. Not too spicy, with a hint of fragrant vanilla. A word of caution: You might never want to go back to pumpkin pie. ~Make these one full day before you want to serve them, so they have time to set up and reach maximum yumminess. ~I made a small version in an 8 by 4 loaf pan, due to limited resources (read: a college student budget). If you want to make a half recipe, go for it! ~Bake this cake on the middle rack in your oven. ~For best results, powder the erythritol (in a coffee grinder or blender) before adding it to the crust layer. ~Try to beat as little air as possible into the filling so it doesn’t crack on top. ~You can amp up the spices if you like, using your favorite blend from a pumpkin pie recipe. ~I didn’t use organic cream cheese due to said student budget, going against my self-imposed organic dairy rule. Go for it if you have the means to do so! You can find the recipe for my “natural sweetener blend” here. 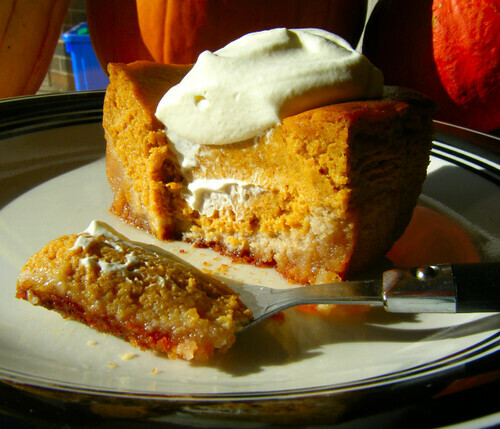 A low carbohydrate version of Paula Deen’s beloved Pumpkin Gooey Butter Cake. You’ll never want to go back to pumpkin pie after trying this considerably more decadent pumpkin dessert! Melt butter and soften cream cheese in microwave. Powder natural sweetener blend in coffee grinder and mix into batter. Mix together until smooth, then add beat in vanilla, egg, sea salt, baking powder, and almond flour until a dough forms. Scrape into an 8 by 8 metal pan and spread out over the bottom. Bake for 15 minutes and remove to cool. Soften cream cheese and melt butter in microwave. Grind natural sweetener blend in coffee grinder or magic bullet. 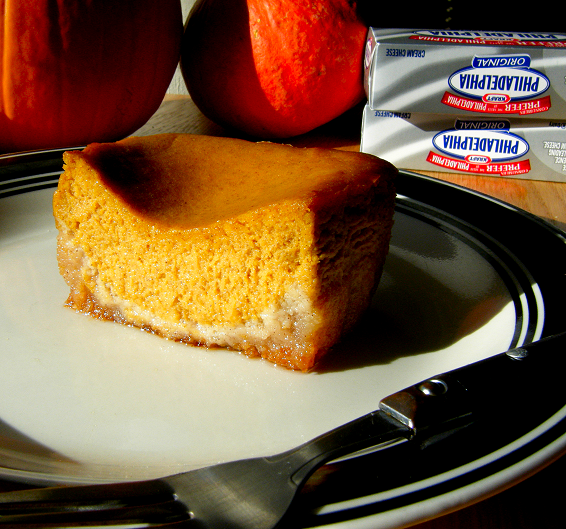 Beat cream cheese and pumpkin until smooth and without lumps. Add eggs, vanilla extract, and melted butter, and beat until incorporated. Next, add natural sweetener blend, cinnamon, nutmeg, and ginger, and mix just until smooth. Rap the pan down on counter top a couple times to get out air bubbles. Pour pumpkin mixture over crust and bake for 55-60 minutes, or until center jiggles a bit when you move the pan. It will set up and sink down upon cooling overnight in the refrigerator. *You can replace the amount of Natural Sweetener Blend in the crust with 1/3 of a cup of xylitol and 1/3 teaspoon stevia. You can replace the Natural Sweetener Blend in the filling with 1/2 cup of xylitol and 1/2 teaspoon stevia. Read more about xylitol here. **If you are using the Trim Healthy Mama sweetener blend, use the conversion chart here to convert from my Natural Sweetener Blend/”Truvia” to the THM Sweet Blend. The math for the conversion comes out to 7 Tablespoons THM Sweet Blend in the crust, and 8.5 Tablespoons THM Sweet Blend in the filling. I did not try the recipe myself with THM Sweet Blend, so I can’t make any promises about this conversion! You’ll have to check the taste of the batter to see if its sweet enough, and add more Sweet Blend as needed. The entire cake contains 3,568 calories, 52g net carbohydrates (fiber subtracted), 329g fat, and 83g protein. Paula Deen’s original cake contains 6,874 calories, 887g net carbohydrates (fiber subtracted), 344g fat, and 70g protein. Serve topped with fresh whipped cream to max out the decadence factor. Let eyes roll back in head. Hi Lauren! I swear you are a genius! thanks so much for sharing with the rest of us! When do you add the almond flour in the recipe? I think you may have left that out by accident. thanks again! You continue to amaze me. I will be trying this as pumpkin gooey butter cake is a favorite of mine. What really always gets to me are your photos. You are a gifted photographer AND cook. I absolutely love your website. Goodness. After looking at the picture, I had to check the title of the post AND blog to make sure this was actually healthy and lower sugar/fat. The picture looked that good. So yummy. Paula would be proud i’m sure. Gooey AND healthy?! Sounds like a dream come true :)! Great recipe to adapt :D.
Recipe says 1 can pumpkin, packed– did you mean 1 cup? I am going to be making this as soon as you tell me! 🙂 Looks bee-you-tee-full! Thanks for this great recipe. This is a nice blog and will be looking forward to read more from you. Penny – Thanks so much for catching that! You are welcome. Anonymous – Thank you! I hope you enjoy the pumpkin cake. I’d to hear how it goes for you! Sophie – Your comments always make me smile! Gwuinifer – Hey girlfriend, it’s one whole can of pumpkin. I think the can said “packed” on the side somewhere, but you are totally right to question these things. Wasting ingredients is such a pain! Lemme know how it goes for you, will ya? okay Lauren, I can’t WAIT to see what you cook up for Christmas. Maybe something gingerbread-like? OR eggnog? Any way, I am SO going to buy your cookbook once you publish one. You ARE going to publish one, aren’t you? Your photos alone would sell me. I am grateful for gluten-free yummy recipes. Ahhh—too late! The low-carb pumpkin pies with almond butter crusts and low-carb vanilla ice cream I just finished making are taking up all the room in my fridge! Thank heavens there’s next week. I made this for Thanksgiving and we LOVED it. I chilled it the night before & it sliced & served up very nicely. We didn't feel deprived one bit while the rest of the family ate regular desserts! I also love your No Bake Bars. They are fantastic! Please keep the recipes coming. Oh, I also bought the Rooibus Tea at TJ's and love it! You are just full of helpful suggestions and recipes!! Thank you SO much! Did you know powdered erythritol is available from Netrition.com? It’s easier than having to grind the granular version. I switched from the granular to the powdered when I discovered it (it almost tastes like confectioner’s sugar). I made this for Thanksgiving and am still enjoying this yummy cake-thank you Lauren for yet another great recipe that I will be using again! If you have fallen prey to obesity and would like to trigger off weight loss as soon as possible, then you should opt for diet pills such as Phentermine and Adipex that are extremely popular for inducing rapid weight loss among people across the world. You will find the relevant details of weight loss pills at http://www.weight-loss-truths.com that inform you that Phentermine is to be taken only after procuring a Phentermine prescription and also in accordance with the instructions of the doctor. So, get hold of a Phentermine prescription, administer the drug properly and transform your weight loss dreams into reality. Oh my word, you’ve got to be kidding me! We did not gain weight by taking a pill, why take pills to loose it! Well said, Barbara!! I was shocked even as I read the above post about taking Phentermine pills. Have we not learned anything?? Was that even legal in 2008, sounds like it was PhenPhen [maybe misspelled]. I just loved your comment and I have never heard that said before. I really wish Lauren would remove that post, as it does not belong here. Made me feel sick. Lauren, you are the best, can’t wait to try your low-low-low carb recipe! I can’t believe how much you cut down everything to let diabetics like me enjoy this dessert again! Thanks from the bottom of my soul!! Abby, I tried to have a look at your blog, but it is hidden. Did you continue to post on it? Wow! I’m literally speachless. I have to make an SCD version of this – now…..
Hi Lauren – hope your studies are going well! This is the year when I finally do this thing! Ah, delicious! And a big hit with with the family! Thanks for another winner, and have a great Thanksgiving! made this for thanksgiving. amazing!!! everyone loved it. great crust. and the filling has just the right amount of sweetness. you are a goddess!! I love to prepare some recipe with potatoes although i know that a person can gain weight if eat potatoes frequently, but i can´t deny that i really like the flavor, most of all when is combine it with some ingredients. Simply delicous. And when i cook, my husband usually is very happy. Actually i was looking information about how tobuy viagra but i reached this blog, i really enjoyed reading. I've said it before and I HAVE to say it again….you are GENIUS! Please please please make a cookbook! I will reserve one before it's even out. This is SUCH a great tasting pumpkin dessert. It's not just "good for a healthy dessert", I mean I'd even say it's better than any normal pumpkin pie I've ever had. I think I may have overcooked it a tiny bit since it didn't sink (I've found that I have to cook less than your recipes indicate. Maybe I have a hotter oven or different altitude). Anyone wondering if this will be a good holiday dessert…I PROMISE you will not be disappointed with this! I'm always looking for new low carb options and this one is fantastic. I did tweak an ingredient or two because of what I had on hand, but this is a fantastic recipe. You have an informative and beautiful site. Lauren! Love the recipe. So if I were to half the recipe, about how long do you think I should bake? Lee, I’m not sure how to adjust the baking times for half recipes. Thanks a bunch for all the really good recipes, they are delicious and at the same time healthy, or at least more healthy than standard recipes. Hi Lauren! Thank you for your wonderful blog full of great recipes. I have moved to a highly restricted carbohydrate diet for health reasons and your posts have really helped me explore non sugar/traditional flour options. My husband and son always insist that on their birthday they want pie – not traditional cake, so that has been the tradition every year. I decided there was no reason I could not make something we could all eat, and found this recipe. What a hit! It really was fabulous! I think next time I will half the crust recipe as it was much thicker than that shown in your picture. I have to say that erythritol is my new favorite sweetner. You cannot really tell the difference between it and sugar in the finished product as far as I am concerned. I made this tonight, as I was looking for a healthy pumpkin recipe. The weather has changed in AZ, and Fall is in the air. I've been feeling the need to bake something for several weeks. This is delicious!! I will be making this for Thanksgiving and will not tell my extended family that it does not have sugar or flour in it. I guarantee you, they will not be able to tell the difference. Thanks so much for an amazing recipe!! I have this in the oven right now and it smells wonderful. I am adding a touch of cinnamon to my whipped cream. Can't wait to try it. Yum..thanks for the recipe. What about subbing Splenda for the erythritol or xylitol? I know the sugar alcohols might be better, but I only have Splenda granulated at the moment and want to make this. Erica, the cake would not turn out well with Splenda. Deb, that’s a good question. Splenda could work, but it doesn’t taste very good by itself. You need to combine Splenda with another sugar-free sweetener, or with sugar, for the taste to be on par with a regular baked good. Thanks for sharing about healthy pumpkin recipe tips.i will try it. What better search engine [url=http://google.com]Google[/url] or [url=http://yahoo.com]Yahoo[/url]? Hello Lauren what can i substitute for almond flour since iam allergic? You could use half ground sunflower seeds, half ground pecans, Bianca. I would reduce the butter by 2 tablespoons. Happy Thanksgiving Lauren! I am thankful that there are bloggers like yourself that provide us with so many delicious and doable recipes to try. I made this SF Pumpkin Gooey butter cake on Monday to see whether it would pass the rigors my husband gives every SF thing I make, and it passed with flying colors, so yummy! Not only have I been sharing this with everyone, even my dentist, I’ve been adding it to my hot cereal in the morning, and my cottage cheese at night. Made it again in the morning for a feast that we will be attending tomorrow. I hope you had a wonderful Thanksgiving! Rica, I’m delighted to hear you enjoyed it so much! Your dentist too? Guessing he was able to appreciate its lack of sugar. 😉 It was a good Thanksgiving. It’s gonna be an even better Christmas since there’s no studying for classes that must be done at the moment. I tried this in a 9″ pie pan. Had to reshape the crust after baking it, but it worked beautifully, if a bit stuck on the pan. Definitely has potential, but is that a misprint on the amount of sweetener in the crust? 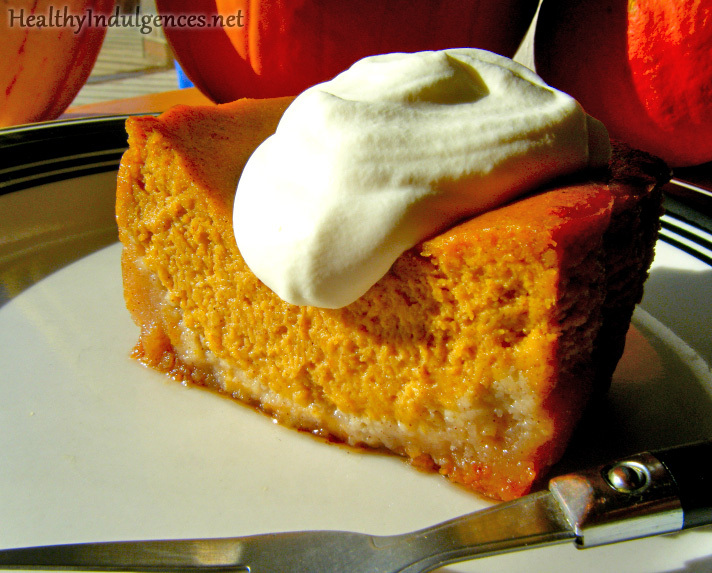 The crust was syrupy sweet and overpowered the flavor of the pumpkin. Also, I think the crust would have benefited from a longer baking time before addition of the filling. The filling could have used a bit more spice. Family ate it up, but black bean chocolate cake still takes the cake. Phillip, when I remade this recipe this year I thought it was a bit too sweet! Did you use NuNaturals stevia and erythritol? The crust isn’t suited to be made in pie form – you’re right about that. 😀 Sorry to hear you learned the hard way! Perhaps adding an egg white would crisp it more. I haven’t made it that way. Thank you for sharing your experience with it! Just wanted to say that the SF Pumpkin Gooey butter cake was a big hit at the gathering. No one believed it was sugar free! I was even able to share the reason why I gave up wheat and sugar, and I think some people just had no idea how bad that stuff is for you. I think the SF Pumpking Gooey butter cake will be a new Thanksgving tradition at our house from now on. Love your recipes! Rica, I love hearing from you! You write such detailed, thoughtful comments that are always a pleasure to read. I’m glad you got to share your reasons for being g-free and sugar-free. How empowering for you, and educational for your family! We made pumpkin gooey cake too this year. 😀 Glad to hear you’ve created a new, healthier tradition! Copy. Paste. Print. Bake. Enjoy!!!! Thank you!!! Hi Lauren – Great site! I just started baking with erythritol so was happy to come across your blog. I clicked on your link for “All you ever wanted to know about erythritol ” but t does not work. Any idea about the link? Thanks! I have been gluten free for a few years now, as are all four of our kiddos, but sugar has been something here recently we have been learning to deal with. We needed a healthier lifestyle, but we still love to have treats for holidays such as this Easter (today). This is an amazing treat, and everyone at dinner today loved it as well. My daughter actually has never liked pumpkin pie, but I told her this was something new to try and she LOVED it! Thank you so much for sharing it! Hello! I just made this and thought it was really delicious. I am just curious though, the bottom layer didn’t really turn out much like a cake, but more like a very thick crust. It’s still tasty, but I am wondering what I did. It also didn’t sink down at all in the middle. Perhaps I baked it for too long? I took it out while it was still jiggly. Just wondering if you have any thoughts. I love everything I make from your site!! Hi, Sarah! The bottom is supposed to be a bit crust-like, but no too hard. Hmm… it may have been a baking time issue, like you said. The cake should sink a bit, but the sinking doesn’t matter as long as the cake’s consistency isn’t too firm. It should be just a bit gooey when warm. Thanks for your feedback, Sarah! Hi, Sarah! Your oven may run hotter than the one I used to design the recipe. 🙂 The cake should definitely be a bit jiggly when you take it out. Shorten the baking time a little, and see if it doesn’t come out more gooey! Thanks for your feedback about the recipe, Sarah. Hi, Sandra! The nutrition facts are in my e-book. You can also enter the ingredients and quantities into the Recipe Analyzer at caloriecount.about.com. Each cup of almond flour weighs 2 ounces. I do not count erythritol or stevia, since the amount of carbohydrates they contain is negligible. Hi, Sandra! The recipe has been updated with the nutrition. I used the Recipe Analyzer at caloriecount.about.com for this. Above, you can even see a comparison to the nutrition facts of Paula Deen’s original version. This looks amazing and I cannot wait to try it!!! Wondering though, about how much pumpkin is 15oz? I have actual pumpkin (from a whole pumpkin) and am not sure how much to use. Thanks!! If you made your own pumpkin puree, I would recommend draining it in a cheesecloth-lined mesh sieve overnight. After that, your homemade puree should contain the same amount of water as the canned stuff. That experiment doesn’t hold up under scrutiny, Blake. I recommend talking to a physics professor at your local college about EM radiation and microwaves for more information about this matter. Yea, after I posted this I did a little further research and found the snopes page on this article. But I still stand by not microwaving cream cheese. It really does get lumpy! Sorry for the post of misinformation. Blake, you made a good point about cream cheese being tricky to heat up in the microwave. Do you have a suggestion for an alternative method of heating it? It took me over a month to find this page! I suggest softening cream cheese on the warm stove. My grandmother often used a double boiler to melt it down. Made this tonight and everyone loved it – thanks for another great recipe! Hi! I can’t wait to try this tomorrow! I had a quick question regarding step 5. It says to add the sweetener blend and then stevia. So are we supposed to add extra stevia since the blend is already made with it? Milena, thank you for catching that! I altered the ingredients to show “natural sweetener blend” in place of the erythritol and stevia, but didn’t alter the instructions. Will change the instructions to show “natural sweetener blend” now. No additional stevia needed. Hope that helps! Hi could you tell me how the exchanges would work if you used swerve sweetener? Shi, I have not tried this recipe using Swerve, but my best guess is that you would use 1/2 cup in the crust and 3/4 cup in the filling if you are using Swerve by itself. I would recommend, if you can, that you add stevia to the Swerve. 1/2 teaspoon of stevia in the crust and 1/2 + 1/8 teaspoon in the filling, combined with the Swerve, would yield the best results! You can find a great tasting pure stevia powder at Trader Joe’s for $1.99. Southred, the word “natural sweetener blend” is linked to the recipe for the blend of stevia + erythritol that you would use. Oh darn. I didn’t see that. 🙁 I only put the 1/2 cup in. I hope it isn’t too bad. No problem! If you put the 1/2 cup in the crust and the 1/2 cup + 2 Tablespoons in the filling, it should still be sweet. Let me know how it turns out for you. HI, LOVE YOUR RECIPES!, BUT I’M STILL NOT GETTING YOUR NEWSLETTER/BLOG BY EMAIL!, TRIED SEVERAL TIMES TO CONTACT YOU AND ALSO TRIED TO RESIGN UP, BUT NOTHING HAPPENS!. Lauren, I just wanted to thank you for your consistency and generosity throughout the years! I came across this recipe at least 5 years ago, and as I am getting back on track with my eating I thought of it and it made my mouth water— how happy was I to see that you still have it available on your website! Thank you so much for all that you do and share! I love love LOVE this show! I do hope it comes back soon! Jill Scott was incredible and her goofy secretary was so adorable. I never read the books though and NOW I wanna go to Botswana. May 9, 2010 Personally I can fully recommend uninstalling Husband 1.0 and replacing with Husband 2.0. This is a much younger application that comes with all programs that Husband 1.0 could not handle as standard. Dr Queen!ditto!!! !the most trifling nigs and wigs online LIVE hereminoring in the majorand majoring in the minorALWAYS…ALWAYS cursing and whining and lying all day every day butNEVER finding one second to defend the INCREASINGLY INDEFENSIBLE hobama….tragic!!!!!!!!!!!! Iam Triveni.K residing in bangalore having 3 year working experience in Bharat Electornic Ltd., currently i prefer to work at home i dont have experience in medical transcription i seatching for training centre for the same. I simply want to mention I am just all new to weblog and absolutely savored your web-site. Probably Iâ€™m likely to bookmark your blog . You surely have fabulous stories. Many thanks for sharing your webpage. The Costco set would be what I would go for, but I don’t have a Blu-ray player. Also, the BestBuy set looks really good, but also very expensive. :/ As it stands, I’ll probably end up getting the Target set. Hi! I’m so excited to have found your website! I’m wondering, would honey work instead of the sweeteners in this recipe? and, generally- what would the substitution ratio be between the other sweeteners and honey? does honey have similar enough baking properties for recipes to still turn out? Thanks!! Em cÃ…Â©ng thÃ¡ÂºÂ¥y chÃ¡Â»Â‰ nÃƒÂªn duy trÃƒÂ¬ mÃ¡Â»Â™t Ã„Â‘Ã¡Â»Â‹a chÃ¡Â»Â‰ nhÃ¡ÂºÂ­n tiÃ¡Â»Ân. Mong nhÃ¡Â»Â¯ng ai yÃƒÂªu mÃ¡ÂºÂ¿n CÃ†Â¡m ThÃ¡Â»Â‹t nÃƒÂ¢ng cao cÃ¡ÂºÂ£nh giÃƒÂ¡c, khi tÃƒÂªn cÃ¡Â»Â§a chÃ†Â°Ã†Â¡ng trÃƒÂ¬nh Ã„Â‘ÃƒÂ£ Ã„Â‘Ã†Â°Ã¡Â»Â£c nhiÃ¡Â»Âu ngÃ†Â°Ã¡Â»Âi biÃ¡ÂºÂ¿t Ã„Â‘Ã¡ÂºÂ¿n thÃƒÂ¬ khÃ¡ÂºÂ£ nÃ„Âƒng cÃƒÂ³ kÃ¡ÂºÂ» lÃ¡Â»Â£i dÃ¡Â»Â¥ng lÃ¡ÂºÂ¡i cÃƒÂ ng nhiÃ¡Â»Âu. Es gibt ja diese Deutsch-Türkischen Vereine in jeder Stadt. Vielleicht dort mal anklopfen. Eigentlich spielt der dritte Türke etwas Saz, würde ich mal klischeehaft behaupten. Vielleicht erwischst Du einen, der etwas Didaktik dazu drauf hat. Hi! This sounds wonderful but I can’t do almonds. Could I substitute hazelnut meal or another ground nut? Also, I was actually looking for a sugarless, eggless ice cream recipe. Do you know of a good one? I had tasted the original Paula Deens recipe and I WILL say this is a very good alternative. It had the same consistency of the original recipe. Everyone loved it. The only thing I missed is the buttery taste of the yellow cake flavor. So most likely I will experiment with flavorings for the cake part. I made this the day before in an 8×11 glass pyrex dish. Its best 1 day old. I put in fridge and sat out 30 min before room temp. before eating. After that I feel like the cake is starting to dry out after days 2 & 3. My sis had frozen her pieces and then defrosted in microwave and she said it tasted fine. Will make again! Thank you for this!